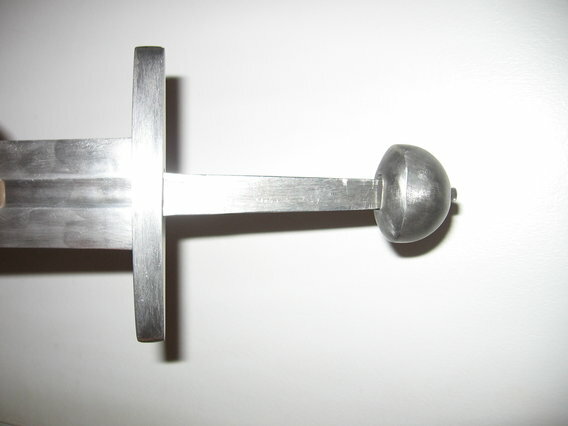 Just wondering how the medieval swordmaker would have described or called his pommel. Brazil nuts only come to the attention of western man after the 'discovery' of South America, and all our Brazil nut pommels predate that by quite a bit. So what were these pommels called back when they were making them ? I heard such pommels are also called lentil shaped. Maybe ancients called it like that or had another everyday common shape similar to that to borrow its name to such pommels. Btw, I plan to take some better pictures of it, these were first pictures taken the evening I brought it home from tax office. Nice - I really like that one. I was feeling sorely tempted before you picked it up. I got my customized Del Tin 2130 customized even more by Alojz Krišto... I really like how it turned out. And some photos of it with an A&A custom from my previous post. Nice paring Luka. I would not recognize the Del Tin if you did not say so; the pommel has changed, the cross, the handle - was anything done to the blade? Did he modify the hilt components or are they completely new? The cross is modified 2142 cross and pommel is it's original pommel modified. The pommel was more than enough big to loose some weight... The blade has no changes, I'm satisfied with the blade. 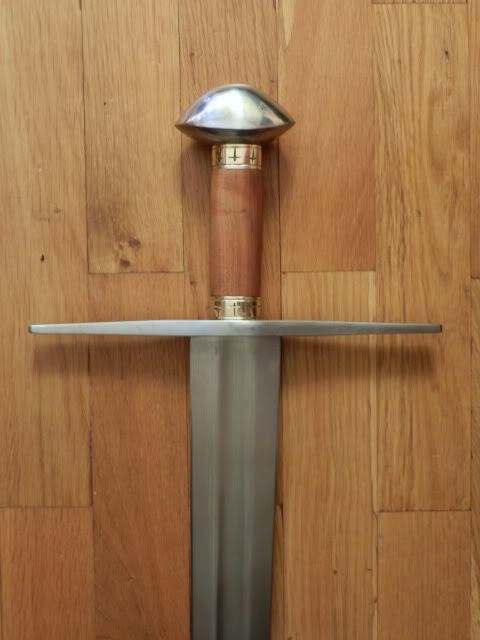 How did lightening the cross and pommel affect the handling and harmonics? Looks great Luka! I really like the 2 swords together! 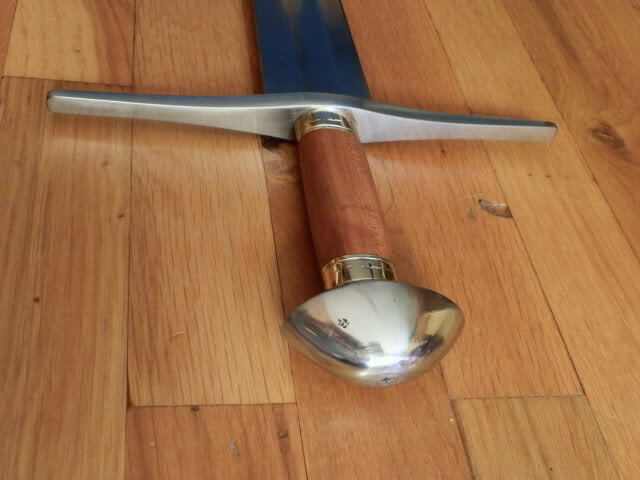 J.D., it did push the PoB a bit forward, but not much, and now there are these brass collars on the grip and that adds some weight instead of a pommel. And I usually don't mind a bit farther PoB if that means sword is lighter overall. 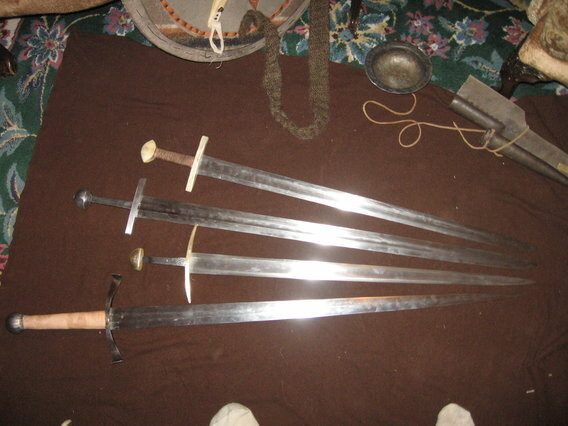 I would really like to try out swords with bigger but hollow pommels, maybe viking lobated types. Harmonics don't seems to be changed but I haven't cut with reworked fittings yet. 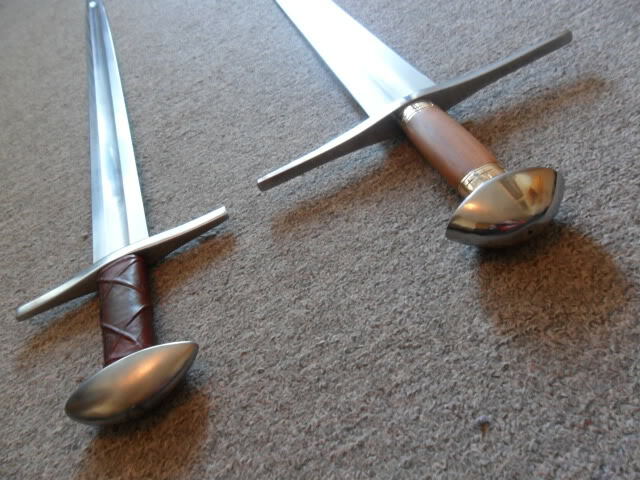 And it's a bit hard to compare handling because grip was a bit too thick for my small hands before and now it's thinner so the sword handles better for me now because of that. 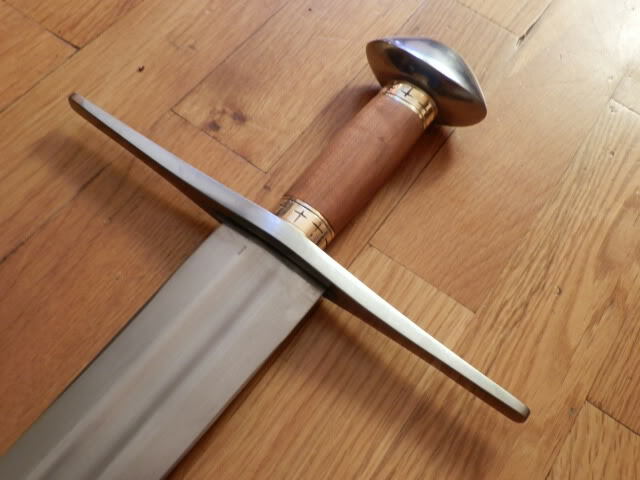 Tim - the sword is on the way from Rob and will visit Marc Ridgeway for a full review before I get it. 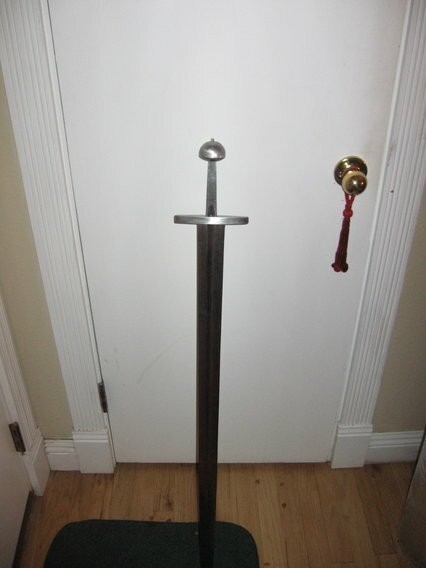 William, awesome sword, it reminds me of Robert Stark's sword on "Game of Thrones." Can't wait for the review. I really like this design and the blade just looks " crisp & clean lines ". Looking forward to reading a review of it. 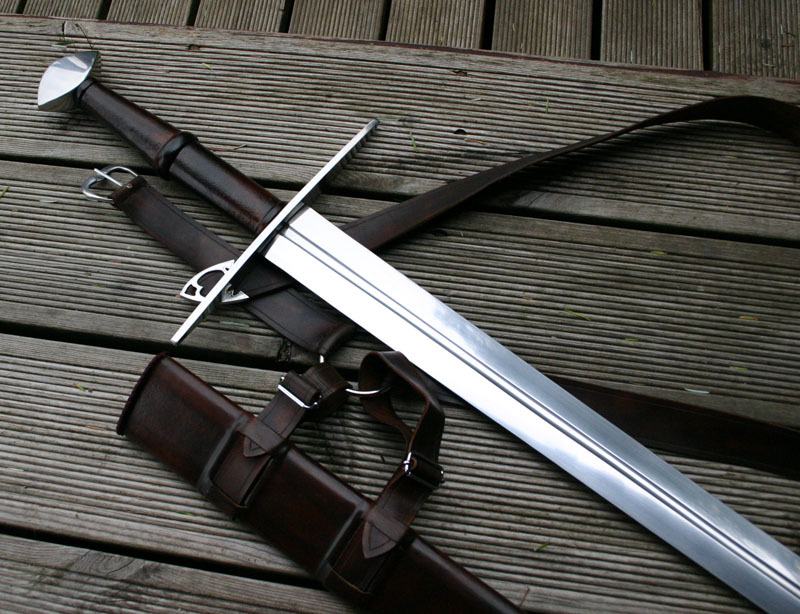 That is a BEAUTIFUL warsword. Very nice! 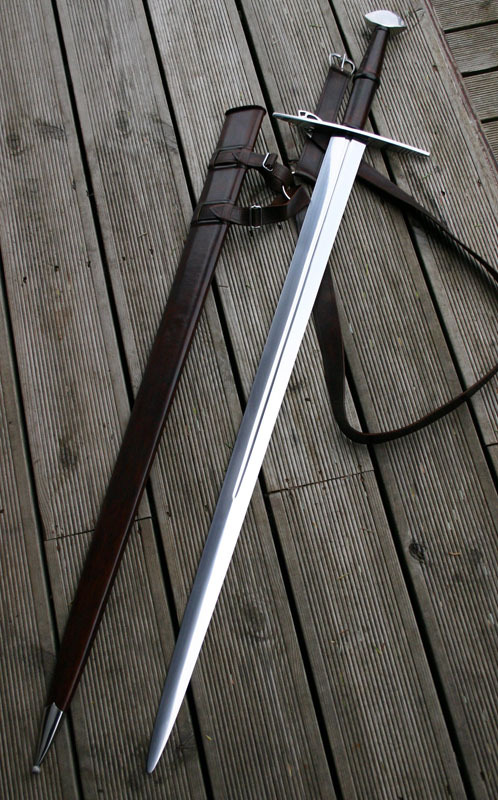 William, that is utterly gorgeous, with quite an attractive functional scabbard. Thanks. Like others said, its great to see an unusual type come to life. This one looks really nice - should have had its own thread! Maybe you will get another chance when the review is done. I am curious how it would feel to handle, given the way that a brazil nut would affect the grip of the second hand. 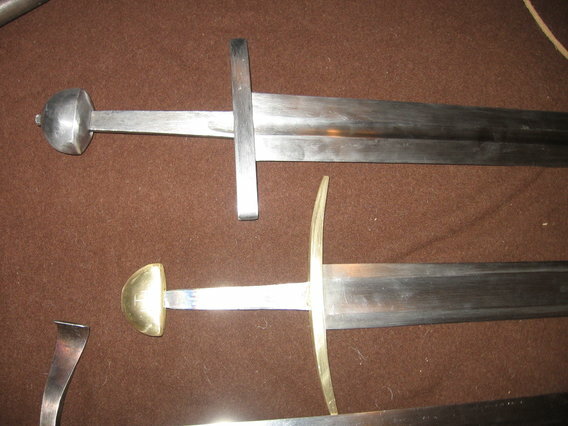 Here are a few really bad cell phone pics of some swords I am working on. 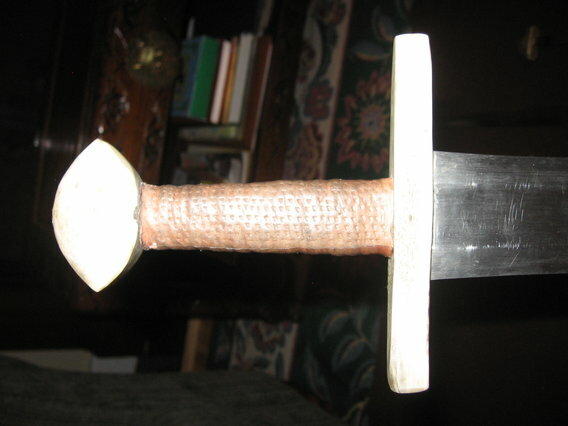 The big single-hander has a blade from a Hanwei Tinker Great Sword of War that has been extensively reground, with some convex profile tapering past the fuller, a lot of distal taper in the last 25cm, much flatter edge bevel, straightened fuller and overall reduced width except at the flaring at the base. 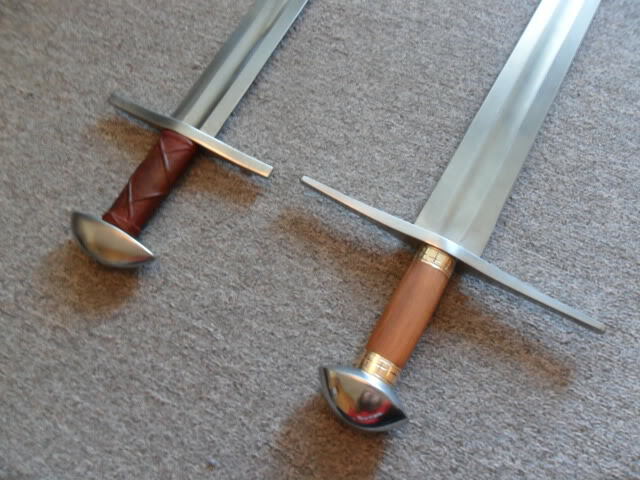 The hilt components were forged from mild steel and were inspired by several 12th century swords illustrated in Geibig's "Beiträge zur morphologischen Entwicklung des Schwertes im Mittelalter." 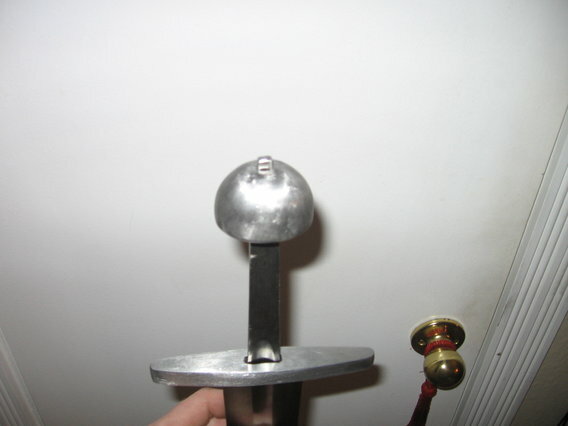 The pommel is partially hollow. Blade length is just shy of 36", total length is 41.75", mass without grip is just under 3 lbs and cog is 6". 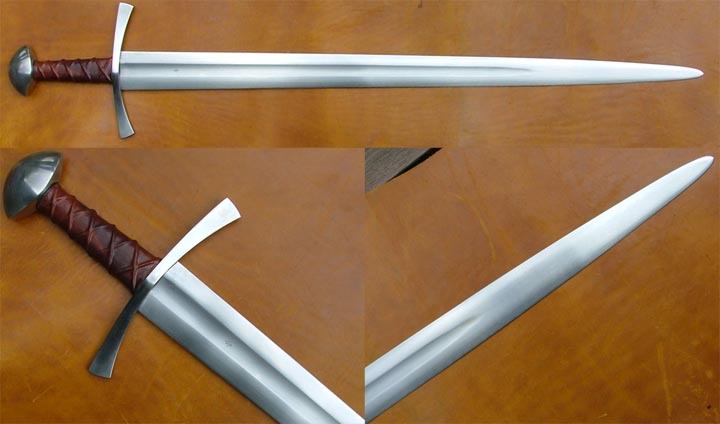 The brass-hilted sword has a blade ground from a Hanwei Mercenary. Can't see it in these pics but there is a cross potent inlaid in tin on one side of the pommel. The other sword has cross of Cervus elaphus antler and pommel of Alces alces antler. The blade is ground from a Hanwei Tinker blunt. 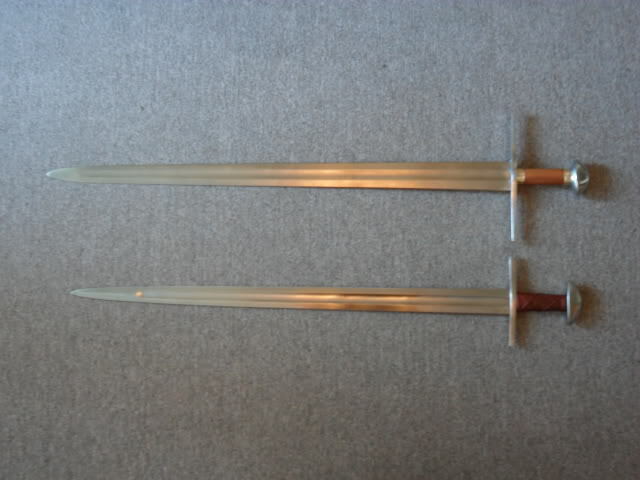 For the moment (until I sell my last Del Tin) I own both the Albion St. Maurice and the Del Tin 'Historical' version of St. Maurice (with a longer blade than the standard version). 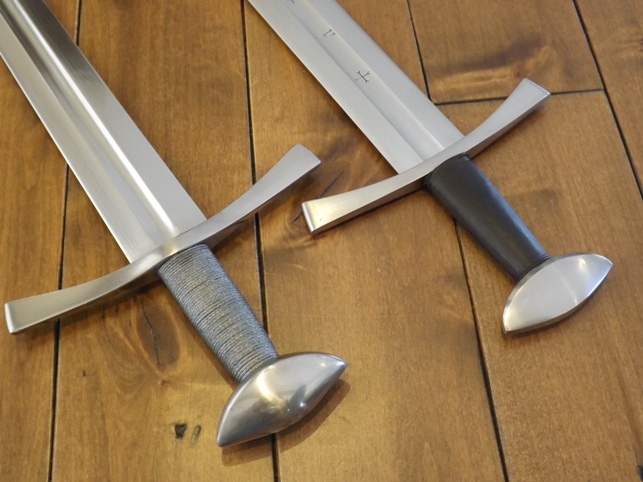 The Del Tin is not quite factory issue --I added a wire grip and did quite a bit of work on the blade-- but still I thought it would be cool to show them side by side. 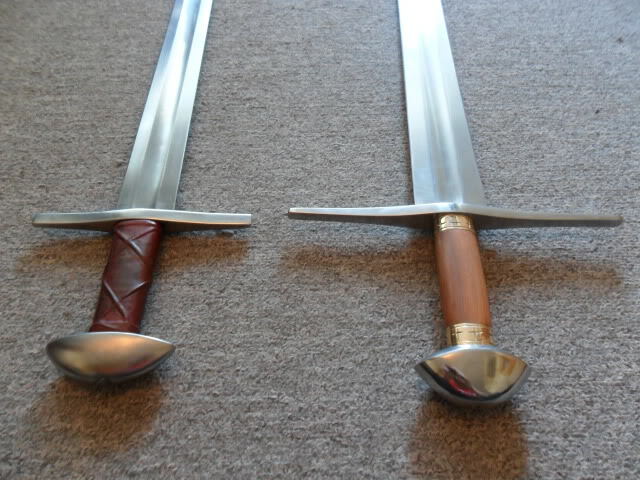 The longer version of the Del Tin is still shorter by a bit more than an inch in the blade than the Albion, heavier by a couple of ounces (probably mainly in the pommel and cross), and has has a lower PoB (by 1.5" originally, 2" after my blade work) compared to the 9" PoB on the Albion. 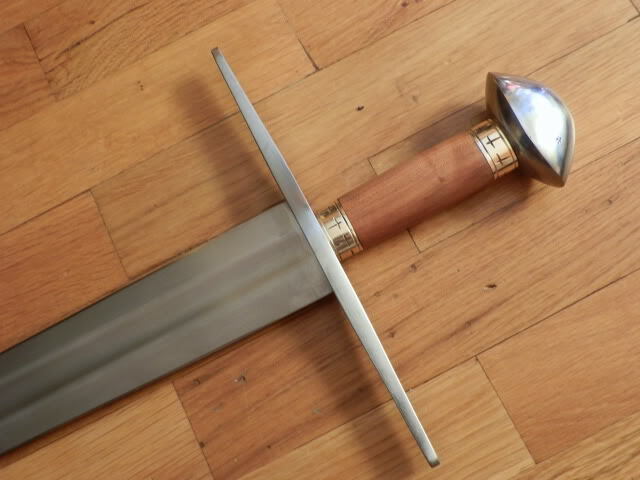 The Del Tin is actually somewhat easier to handle, but the Albion is clearly more accurate to the original in the length of fuller (its an Xa/XII whereas the Del Tin is a true Xa), the blade length and profile, blade inscriptions, and the lighter, more angular pommel. 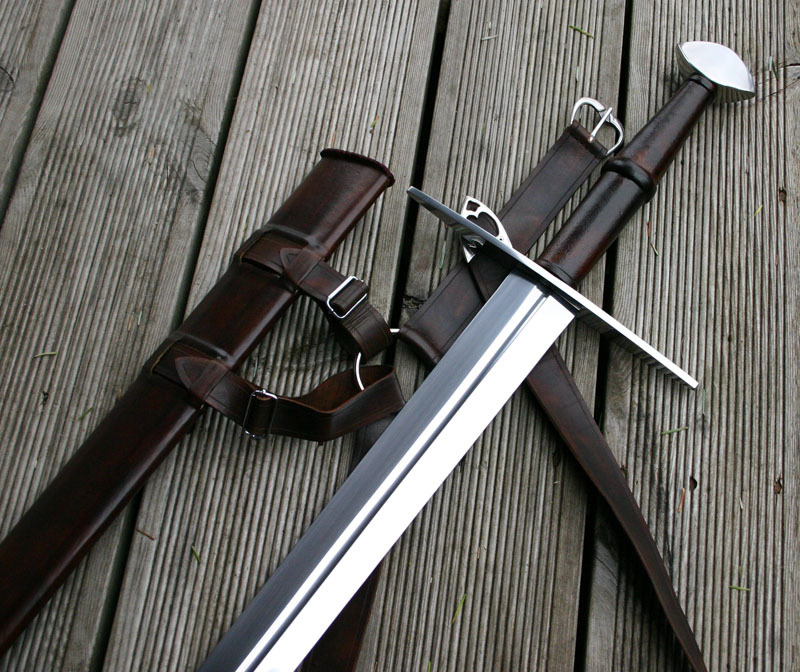 The Albion is obviously a more refined sword, but they both have their merits.